Scientists have demonstrated an “incredibly powerful” ability to manipulate the building blocks of life in two separate studies. One altered the order of atoms in DNA to rewrite the human genetic code and the instructions for life. The other edited RNA, which is a chemical cousin of DNA and unlocks the information in the genetic code. The studies – which could eventually treat diseases – have been described as clever, important and exciting. Cystic fibrosis, inherited blindness and other diseases caused by a single typo in the genetic code could ultimately be prevented or treated with such approaches. Both studies were performed at the Broad Institute of MIT and Harvard. The first, published in the journal Nature, developed tools called base editors. DNA is built out of the four bases: adenine (A), cytosine (C), guanine (G) and thymine (T). If a single one of them is in the wrong place, it can cause disease. Base editors alter the molecular structure of one base to convert it into another. Researchers can now manipulate the four bases. And the team used base editing to correct an inherited disease that leads to dangerously high levels of iron in the blood. The second study, published in the journal Science, focused on RNA, another of the molecules essential for life. DNA is the master copy of the genetic code, but in order for a cell to use the genetic instructions, it must first create an RNA copy. It is like going to a library where you cannot read any of the books, but can only use photocopies. The researchers used their RNA approach to correct an inherited form of anaemia in human cells. 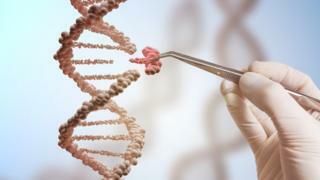 Feng Zhang – also of the Broad Institute – said: “The ability to correct disease-causing mutations is one of the primary goals of genome editing. All of the experiments were on human cells growing in the laboratory. Dr Helen O’Neill, from UCL, said: “This is an exciting week for genetic research. Scientific advances in genetic engineering are taking place at an incredible pace. And the same technologies work on plants, animals and micro-organisms too, posing questions for areas like agriculture. Dr Sarah Chan, a bioethicist at the University of Edinburgh, said we can no longer pretend the technology is too dangerous to contemplate. She told the BBC: “We can’t hide any more. “The science is moving fast in the sense it is becoming less risky, more certain, more precise and more effective.